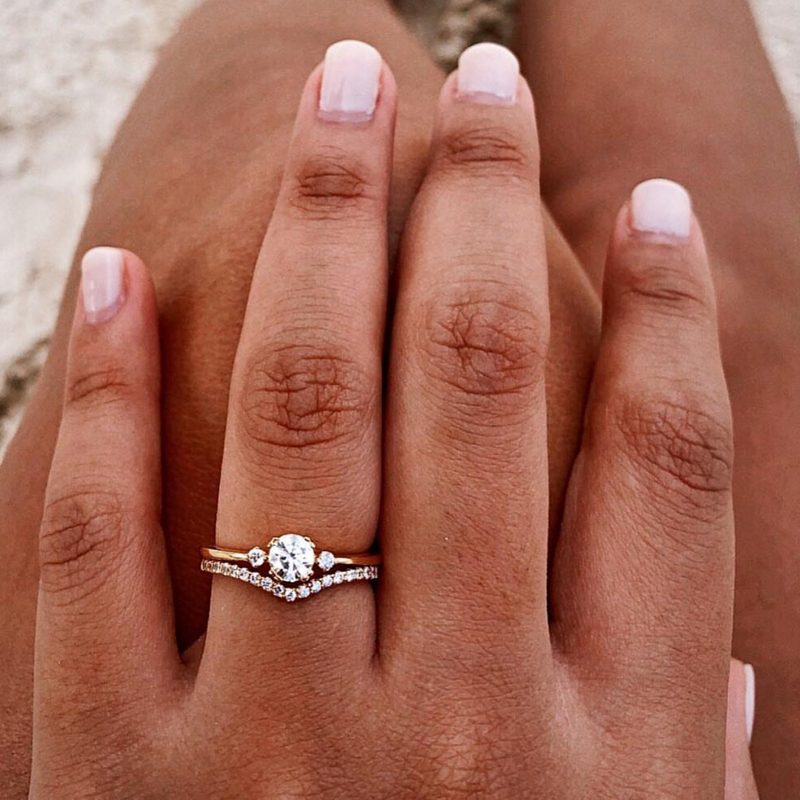 So you just got engaged and your engagement ring is exactly what you wanted, thanks to Sparkly’s registry ;) Bravo. You can’t stop staring. You’re madly in love with uh, S.O (but also the ring) and you never want to take it off for the rest of your life. But eventually, it dawns on you. There will be another ring. Eventually, there will be a wedding band trying to find its way through life on that same finger. What do you do? Do you sacrifice your blingy engagement ring and let your wedding band do the talking from now on? Or do you keep them both, happy, together, forever? We’re here to tell you that your engagement ring and your wedding band can live happily ever after (just like you). Subtlety is smart. It’s harmony you’re after, not one ring trying to outshine the other. If having your engagement ring sit flush with your wedding band is important, there are 3 ways to accomplish this: Contoured, notched and, contoured and notched bands. These are designed to accommodate your center gemstone and prong setting. You don’t necessarily have to have the same metal, but it’s kind of a no-brainer that yellow gold goes with yellow gold, rose gold goes with rose gold and so on. Some engagement rings are designed and sold with a matching wedding band. In some cases, your two rings can be welded together. Ask your jeweler if that’s an option. Really, what it comes down to is what feels right to you. When it comes to sentimental jewelry that you’re going to wear the rest of your life, it’s about what’s comfortable and finding the best representation of your enduring love. If your rings don’t sit flush or you’re not drawn to a traditional band, wear them on different hands! It’s 100% ok to make up your own traditions. See tons of real life wedding band examples by simply toggling "WITH WEDDING BAND" on the homepage filters.